Throughout the first half of the 1970s, standard motive power on the Clinton Branch was a black EMD SW-7/8/9 switcher, leading the Clinton Local down and back the 13.5 miles between Clinton and Lenawee Junction, Michigan. With the arrival of Conrail in 1976, things began to change—GP-7s, still in Penn Central black but with “CR” initials, began making an appearance on the local. 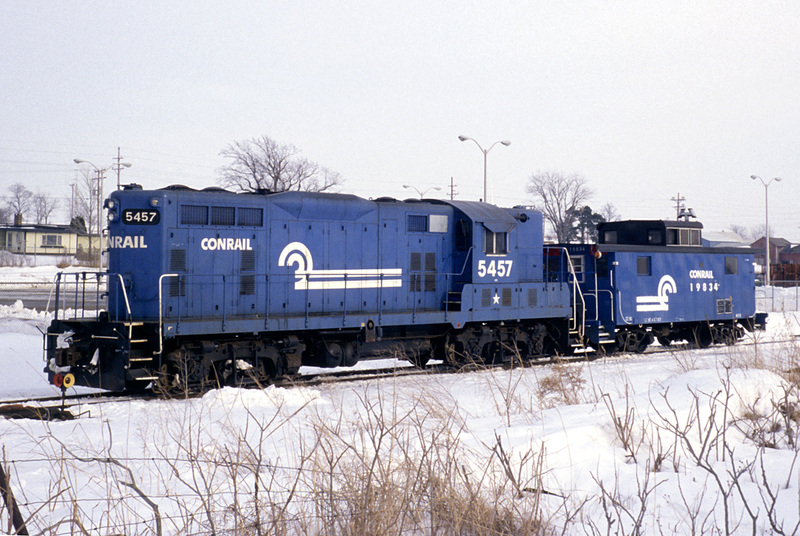 The revolution came in 1979, when Conrail GP-8 #5457 was assigned to the Clinton Local. Replacing long-time regular PC #5778, #5457 was something new. It wore fresh Conrail blue paint that shone. Not only the outside has been refreshed—this Geep was one of 39 GP-7s rebuilt into GP-8s in 1978 as Conrail struggled obtain reliable motive power. #5457 was rebuilt at the Illinois Central Gulf’s Paducah shops, a fact proudly attested to by an ICG plate under the cab. The locomotive also carried a star under its number, indicating it was used as a special maintenance test unit. CR #5457 was a newcomer to this line. It was not of Penn Central heritage, but rather built in October of 1950 for the Erie Railroad as their #1204, later serving the Erie Lackawanna before hitting a Conrail dead line. Work at Paducah included mechanical and electrical overhauls, setup for long-hood forward operation, and removal of the dynamic brakes (although the “blister” remained). In this snowy scene, captured by Edward Hodges, CR #5457 and regular caboose CR #19834 sit out the weekend behind the Budd Company Plant in Clinton on Sunday, 15 February 1981. #5457 would serve as the regular locomotive on the Clinton Local from 1979 until 1981.